Sell Your Book with Your Index! Even though there are over 120,000 libraries in this country, each library has to be selective in what books it buys. This is because nearly every library in the US serves an institution or a local community. To serve their communities, most libraries create and stick to using an “acquisitions policy”. An acquisitions policy spells out what kinds of books librarians and their library staff member can order and what they can’t. The library may also have a gift policy – this policy spells out what books the library will or won’t accept. An index for nonfiction books is generally one of the green lights for adding a book to a library. Getting positive book reviews is the most fiery hoop your book (fiction or non-fiction) will need to leap through in order to satisfy the criteria of a library acquisitions policy. Librarians regularly turn to reviews when choosing books. Reviewers at the particular review sources librarians use for book selection will also place a great value on a book having an index. Often book reviewers will point out whether a book has a great index…or no index at all! This is why your index should be one that will help your book get a great review! In addition, nonfiction books that help librarians answer questions that their patrons ask at the reference desk must have a good index. These books go into a special section(s) of the library where they cannot be checked out – they are always there for use by librarians working at the reference desk(s) in those areas. Busy reference need to be able to get at information as fast as possible. Your book could be the best one of its kind, but if it can’t be accessed quickly for specific bits of information, it won’t be bought for reference area use. What kind of books go in reference areas? Visit libraries near you and find out! You’ll see everything from cookbooks to auto repair manuals and textbooks to encyclopedias, maps, directories, collected biographies, and statistics about all kinds of things. What’s the very best way to market your book to libraries? A great way to sell your book to libraries is to put a copy of your index on a WordPress blog site for your book. You can also display your table of contents. You too can do what Amazon does with its “Look Inside!” feature. To display your table of contents or index, simply print out a PDF file of each page of your index or contents. Then upload the images of those PDF pages to your site. On a blog site, you can do this in only minutes using plug-ins. 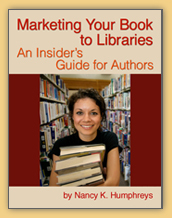 For an example, see the index to my book, Marketing Your Book to Libraries: An Insider’s Guide for Authors. Your nonfiction ebook needs an index as well. If it is a good resource for librarians to use in their Reference area, they’ll want it to be available and quickly accessible by its index. I know it may be difficult to think of reference librarians of the future walking around with an iPad, Nook, or Kindle or even a cellphone-sized device instead of standing or sitting with a desktop computer and bookshelves full of books nearby, but that is a most likely scenario for future libraries! For more details about marketing your book to libraries, library patrons and other book lovers see the links below. Why you should plan to Sell your Book(s) to Libraries! How to create and use a Home(page) Just for Your Own Book! 50% of public library patrons buy books written by authors they discover at the library! Instant-download PDF, $24.95, now on sale for $19.95.